The most populous continent on the planet in terms of humanity is also one of the most biodiverse in terms of wildlife. 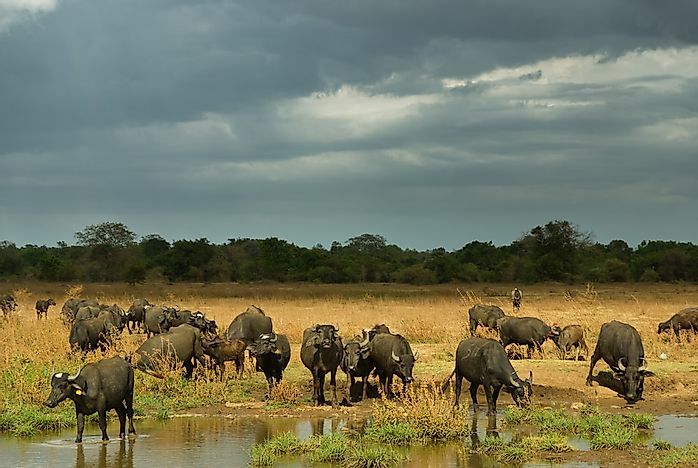 A herd of wild buffalo graze in Sri Lanka. Asia has some of the most diverse and unique wildlife species native to any of the world's continents. 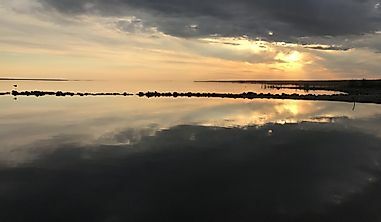 But while some of these species have populations that are thriving, others are facing threats that that threaten to wipe out their populations from off the face of the earth. The Malayan Tapir (Tapirus Indicus) is an endangered mammal in the tapir family, native to southern Thailand, southern Myanmar, Malayan Peninsula, and the southern and central parts of Sumatra in Indonesia. It looks like a pig or an ant eater, and has a distinctive snout whose upper lip curves, and hangs over the lower lip. The rump, back, and mid part of the underbelly is white, while the head, neck, and four legs of the Malayan Tapir are black. At 1.8 meters in length and weighing about 720 pounds, it’s the largest of the four Tapir species according to Tapir Specialist Group. The Malayan Tapir is a solitary animal except when reproducing. It also whistles to communicate. Rainforests, lower montane forests, and secondary regenerating native forests, are the ideal habitats for the Malayan Tapir. There are about 1,500 to 2,000 Malayan Tapirs remaining, and their population is decreasing. This is due to habitat loss to illegal logging and hunting. 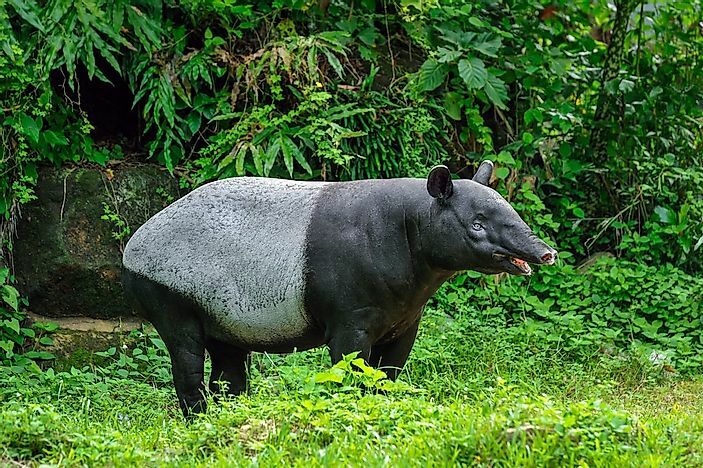 The Malayan tapir achieves sexual maturity at 3 to 4 years, and its lifespan in the wild is between 25 to 30 years, according to National Geographic. Unlike other rhino species, the Indian Rhinoceros () has a single horn. This herbivorous grazer has a distinctive grey-brown hide with folds on the neck, shoulder, and rump. The folds make the Indian Rhinoceros appear to be wearing armored plates. The male’s head and body length is 3.68 to 3.80 meters, while a female is 3.1 to 3.4 meters. The shoulder height of a male Indian rhinoceros is between 1.7 to 1.86 meters, and for female is 1.48 to 1.73 meters. A mature male weighs 2,200 kilograms and a female weighs 1,600, according to ARKive Initiative. 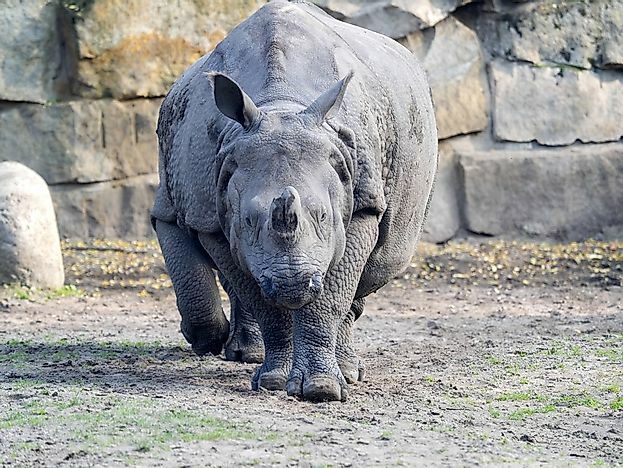 India and Nepal are countries where the Indian rhinoceros is found, but in the past there have been populations in Bhutan, Pakistan, and Bangladesh. These countries have tropical and subtropical grasslands, savannas, shrub lands, forest, and swamps, all ideal habitats for the Indian rhinoceros. The International Union for Conservation of Nature (IUCN) classifies the Indian Rhinoceros as a vulnerable species. It faces threats from sport hunting, human-rhino conflicts, and habitat encroachment for agriculture and development. The Indian rhinoceros is a solitary animal except when mating, and males are territorial. Territories are marked with dung piles. To communicate, the Indian Rhinoceros snorts, roars or honks. It has a lifespan of 40 years according to National Geographic. The slow loris is an omnivore forager, and one of three loris species. It’s found in southern Asia, China, western Indonesia, parts of India, Myanmar, Thailand, Vietnam, Laos, and Cambodia. 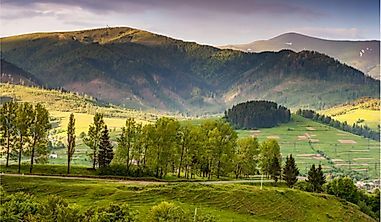 These countries have tropical evergreen forests, secondary forests, and suburban gardens suited for it. 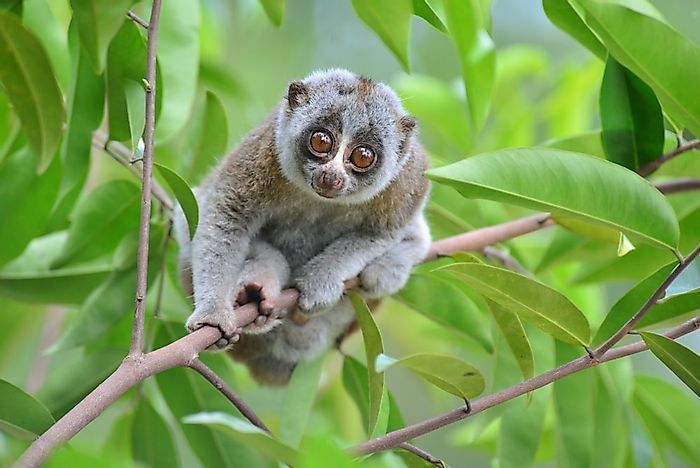 The slow loris lives in hollowed out trees, tree crevices, and branches. Its eyes are round and owl like, and the head round, with tiny ears obscured by fur. Much of the slow loris fur color is light brown, but the underbelly fur is cream to light brown. Slow Loris fore and rear limbs, are similar in size. According to the Duke Lemur Center (DLC), a mature slow loris weighs from 1.8 to 2.9 pounds. Its omnivorous diet comprises of fruits, insects and birds eggs. The slow loris is nocturnal, and researchers believe it leads a solitary lifestyle only coming together to mate. 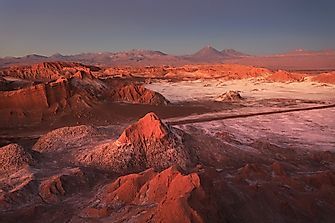 However, family groups have been found to live in one territory, according to the DLC. They communicate with each other by urine marks, after urinating on their hands and wiping them on branches. The slow loris achieves sexual maturity at 18 months, and can live up to 20 years in captivity. The slow loris is a critically endangered species according to the IUCN. It faces threats from deforestation leading to habitat loss, illegal pet trade, and making traditional medicines. The Asian elephant is the largest of the continent’s terrestrial mammals, but smaller than the African counterpart. 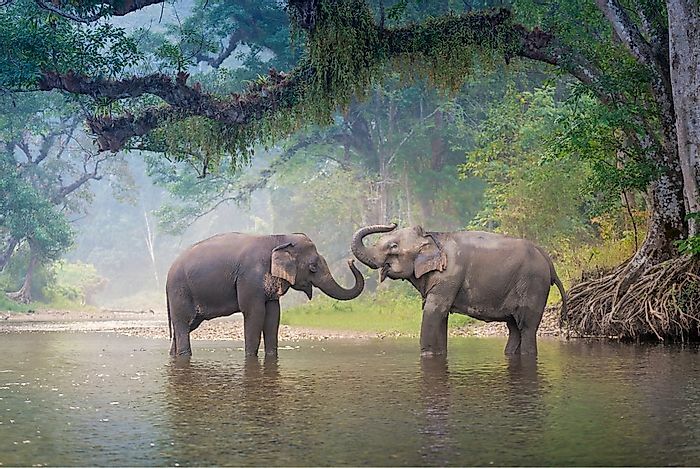 The Indian, Sumatran, and Sri Lankan are the 3 subspecies of Asian Elephants. 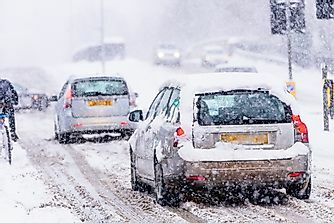 According to World Wide Fund for Nature (WWF), it can weigh up to 5 metric tons each, reach a length of 6.4 meters, and stand 3 meters at the shoulders. Its skin is dark grey to brown, with pink patches on the forehead, ears, chest and the base of the trunk. The Asian elephant has one finger on the upper lip of the trunk, unlike the African specie with a second one on the lower lip. Its populations are spread in the Eastern Himalayas and Greater Mekong regions in countries like India, Sri Lanka, Bhutan, Nepal, Myanmar, Cambodia, Laos, Thailand, and Vietnam. These countries have tropical and subtropical, moist and dry broad-leaf forests suited to sustain the Asian elephant. Female Asian elephants are more social than males, and form herds led by the oldest female. The males live alone, but on occasion group up with other males. Grass is the primary diet of an Asian elephant but also feeds on tree barks, roots, leaves, small stems and farmed crops. In a day, according to WWF they eat an average of 150 kilograms of food and drink water. Female reach sexual maturity at 9 to 12 years while males at 10 to 17 years. The average lifespan of the Asian elephant is 60 according to National Geographic. The IUCN classifies the Asian elephant an endangered species facing threats from habitat loss and fragmentation, due to rapid infrastructure development. According to the WWF there are about 40,000 to 50,000 Asian elephants left. The Giant Panda is an omnivore native to south-central China and a bear family member. It lives in a habitat of temperate broad-leaf forest or mixed forest, where it forages. The giant panda’s thick and woolly fur coat is black and white, and when fully mature it weighs up to 330 pounds. From the nose to rump its length is 1.5 meters, and has a 15 centimeter tail, according to National Geographic. To the shoulder the Giant Panda’s height is about 90 centimeters. Bamboo leaves, stems, and shoots are the primary diet of the giant panda, but it also feeds on meat from birds, and small rodents. In a day it can eat 28 pounds of bamboo to satisfy its diet. The giant panda, leads a solitary lifestyle and avoiding confrontations, except when cubs are threatened. Still, it marks its territorial routes by spraying urine, clawing trees, and rubbing against objects, and can spend 12 hours daily eating. The IUCN classifies the giant panda as an endangered species, whose habitat over the years has been encroached on due agriculture and logging, leading to population fragmentation. 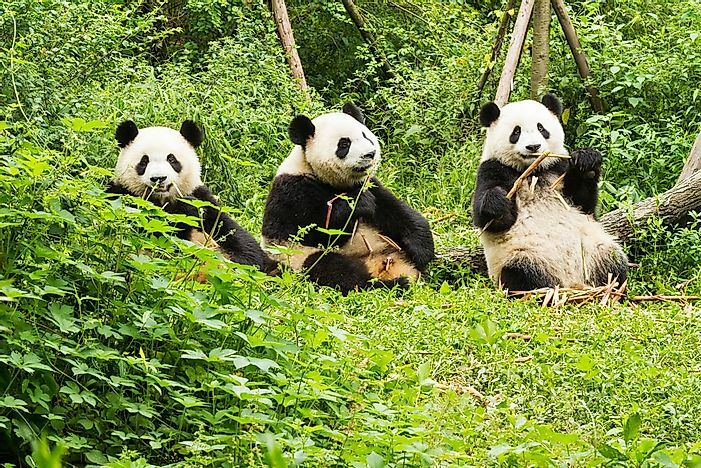 There are about 1864 giant pandas left in the wild, according to the WWF 2014 census. The giant panda achieves sexual maturity at 5.5 to 6.5 years, and in captivity, can live up to 30 years old, according to the WWF. The Indian Cobra is a venomous snake native to the Middle East, India, China, Bangladesh, and Indonesia in their tropical environments. At full maturity, this reptile can grow to be 1.8 to 2.22 meters in length according to Animal Diversity. Its body color ranges from cream white, brown, and black and others have half ring patterns on the back of the neck, according to Biodiversity Library Exhibition. The Indian cobra lives anywhere it finds shelter, even in human settlements. 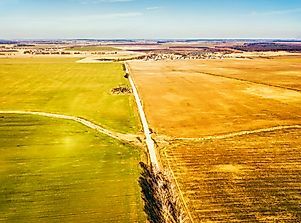 In India, its bites kill 10,000 people annually and most of those who step on it work on rice paddies. In such environments, the Indian cobra eats mice, rats, lizards, poultry, frogs and snakes according to ARKive Initiative. It’s active during the evening and early mornings. When threatened it hisses, sways its hood to enlarge and appear aggressive, and bits or spits venom. The Indian cobra reproduces sexually, and the female guards the eggs in hollow trees or on earth, until they hatch, in about 50 days, only leaving them to feed. In captivity, it can live for up to 30 years. 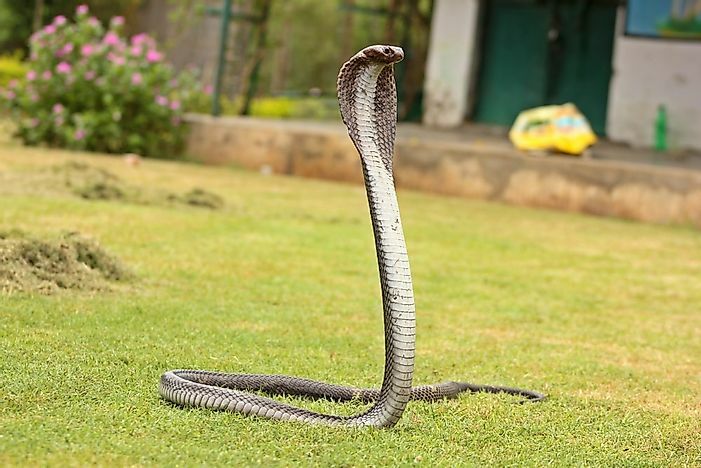 The Indian Cobra is not an endangered species. The Lesser Bird of Paradise is found in pacific countries like Papua New Guinea, eastern Australia, and Southeast Asia, mainly Indonesia. 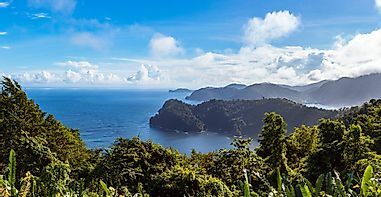 In these regions, lowland and tropical rainforests, swamp forests, forest edges, and secondary growths are its habitats. This bird is one among 45, Birds of Paradise species. The lesser bird of paradise is 32 centimeters in length, tail wires not include. The male weighs between 183 and 300 grams, the and females 141 to 210 grams, according to the Australian Museum. The lesser bird of paradise plumage have colors like black, white, grey, green, brown, blue, yellow, and red. A mature adult male has a yellow head and back, shiny green throat, brown wings and body, yellow feathers, and fine brown tail feathers. An adult female has a dark brown head, yellow nape and mantle, mid to dark brown upper parts, and white under parts, according to the Australian Museum. Being polygynous, a male mates with several females at once while perched on trees, and the most dominant male get the most copulation. Lesser Bird of Paradise omnivorous diet consists of fruits, arthropods, insects, and snails, according to the WWF. Lesser Bird of Paradise is not threatened hence classified as of least concern by the IUCN. As collective Birds of Paradise species, females achieve sexual maturity at a year, and males at 4 years depending on the specie, according to the San Diego Zoo. In the zoo they can live up to 30 years. 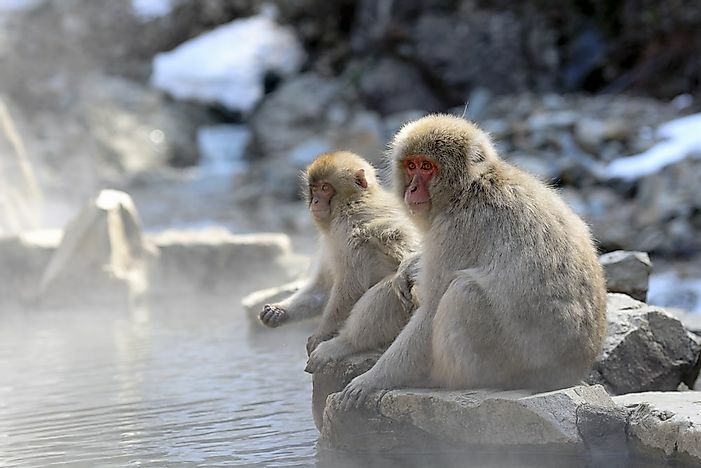 Also called the snow monkey, the Japanese Macaque is native to Japan in Honshu, Shikoku and Kyushu islands, and the smaller Yakushima Island. Its head and body length is between 47 to 60 centimeters and the tail is 7 to 12 centimeters. A male Japanese Macaque weighs 11 kilograms, and a female 8 kilograms according to ARKive Initiative. Its fur is dense and brown to grey in color. The face and rump of a mature Japanese macaque is red. The face also has whiskers and beard. The diet of a Japanese Macaque depends on seasons. It can feed on leaves, berries, seeds, small animals, insects, tree bark, buds, crabs, bird’s eggs, and fungi, making it omnivorous. The Japanese Macaque habitat is broad-leaf, deciduous, and evergreen forests. It’s also a social animal and lives in troops with about 41 monkeys, or at times 700. Male Japanese Macaque move within troops, but females don’t hence, are maternally related. Access to food in these troops is determined by hierarchy. Sexual maturity for a female begins at 3.5 years and for males at 4.5 years, according to Animal Diversity. The IUCN classifies the Japanese Macaque as of least concern, and not globally threatened. In the world, it lives on average 6 years, but in a zoo it can live for up to 30 years, according to Zoo Sauvage de St-Felicien. 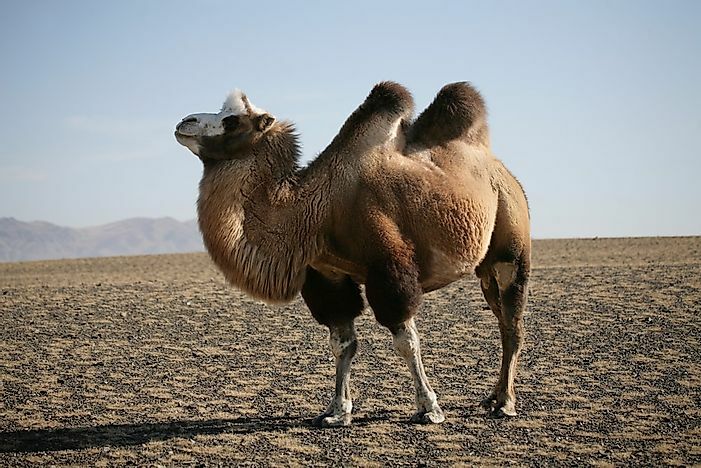 The wild Bactrian camel with two humps is native to the deserts of southern Mongolia, northwestern China, and Kazakhstan. Bactrian camels migrate, and exist in habitats like the rocky mountain massifs, flat arid deserts, stony plains, and sand dunes in those countries. According to ARKive Initiative, this camel weighs from 600 to 1,000 kilograms, is 3 meters long, with a height range of 1.8 to 2.3 meters up to the hump. The Bactrian camel’s fur is light grey-brown and beige in color. The thick fur is unkempt during winter, and gets rapidly shed in spring. Shrubs and grass are the primary diet of the Bactrian camel, but they also feed on thorns, dry vegetation, and salty plants. In one intake the Bactrian camel can drink 57 liters of water. It’s also adapted to take salty or brackish water without being harmed, according to the Zoological Society of London (ZSL). Bactrian camels are social and live in herds of 5 to 30 animals, led by a dominant male in grazing areas, according to Woburn Safari Park. It achieves sexual maturity at ages 3 to 5, and can live up to 50 years, according to Animal Diversity. This camel specie is classified as critically endangered by the IUCN. It faces threats from poaching for meat and hides, sport hunting, habitat destruction by toxic illegal mining, and loss of water sources due to drought. India is where large populations of the Bengal tiger are found, others are in Bangladesh, Nepal, Bhutan, China, and Myanmar. 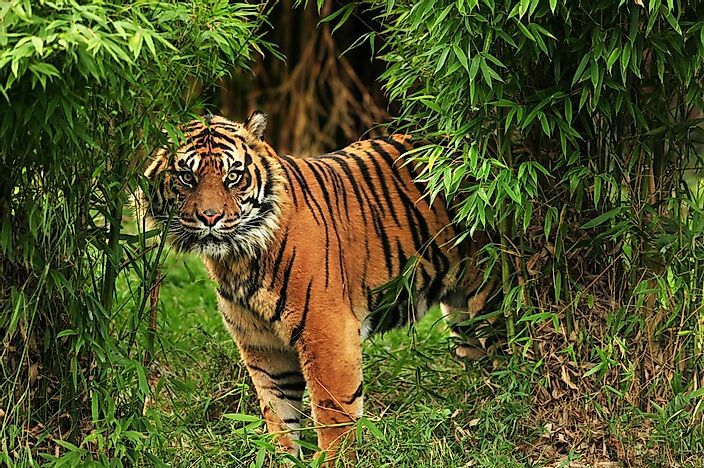 These countries have dry and wet deciduous forests, grassland and temperate forests, and mangrove forests all ideal habitats for this tiger, according to the WWF. An adult male Bengal tiger weighs up to 500 pounds and a female about 310 pounds, according to Tigers World. Its body color is orange with thinner black stripes. There is also the white Bengal tiger, with thin brown or black stripes. Plus the golden tabby Bengal tiger specie with whitish-yellow color, with amber stripes on the side. Deer, antelope, hog, buffalo, monkey, birds, and livestock are among the Bengal tiger prey. This tiger is nocturnal and hunts at night, and can swim and climb trees. The Bengal tiger leads a solitary life, but at times they move as 3 to 4 tigers, and when happy or pained it purrs. It’s also an endangered species with only around 2,500 of them left due to habitat loss and fragmentation caused by human development and poaching. The Bengal tiger achieves sexual maturity at 3 to 4 years. In the wild it can live for 10 to 15 years, but in captivity up to 20 years, according to the Indian Tiger Welfare Society.